Refreshing Green Juice is way better than sugar-filled drinks you buy from market. Besides, it is healthy as it is sugar free, no preservatives and packed with herbs like mint and parsley, which you might not have enough in your regular diet. What’s the best about this green juice is that it’s extremely refreshing thanks to lime and cucumber. This is the drink you will need during intolerably hot days in summer. And no juicer is required! 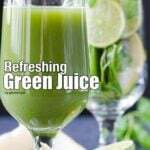 The most important thing to make a tasty refreshing green juice is to balance the flavors well. If the greens and the sweet fruit are not used in the right amount, you might end up with a drink that tastes just like grass or weeds. Also you can taste and make changes if you are trying to create your own green juice with your favorite herbs and fruit. Although homemade lemonade is the number one homemade drink in summer, I love to try different and even healthier drinks to cool down. What I love most about green juices is their natural color besides their natural sweetness. It’s great that you can make your own combinations deciding on the herbs you want to involve in your diet and the fruit you want to use as the natural sweetener of your refreshing green juice. For me, lime or lemon and mint are must to have the feeling of refreshment. Parsley and mint are really healthy herbs that we don’t eat enough, so this refreshing green juice is the best way to have a good amount of these herbs in one glass without feeling any predominant flavors. I used 2 pears as my natural sweetener, but you can use pineapple, melon or watermelon too. You just need a fruit that is naturally very sweet. And if you like your drink less sweet, just use one pear. I also used 1 cucumber to balance all the flavors. You don’t need a pricy juicer to maket his Refreshing Green Juice, just use your blender and then sieve the juice into a jug. Blend all ingredients in a blender on the highest level until it becomes well blended. Pour it into a fine mesh sieve and extract the juice using a spatula. Pour it into a jug and chill at least 1 hour before serving.